Weigela ‘Bristol Ruby’ is a cultivar of weigela. Weigela are leafy deciduous shrubs with stunning flowers that put on a beautiful display late spring to early summer (May-June). The ‘Bristol Ruby’ variety has large dark green leaves from spring onward, complemented by vast amounts of dark crimson, funnel-shaped flowers in summer developing from plum-coloured flower buds. The low maintenance requirements combined with its fast growth rate (30-60cm per annum) add to the weigelas popularity as a hedge plant. Weigelas are very easily grown and are not picky when it comes to growing conditions and soil type. 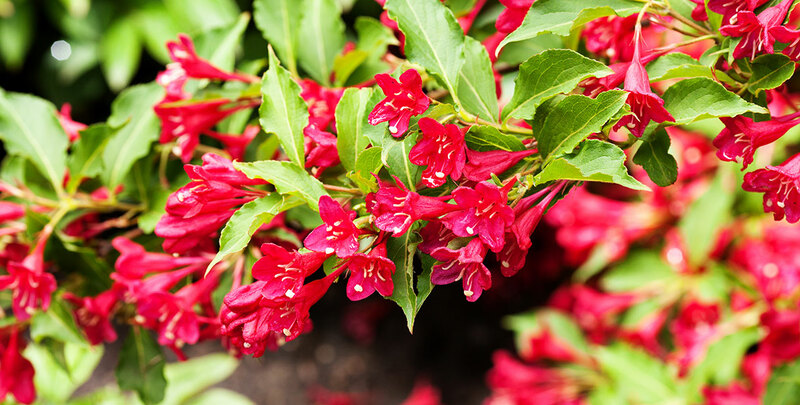 Weigela ‘Bristol Ruby’ will do well in all moist, well-drained soils, so there is no need to do a soil check before planting weigela ‘Bristol Ruby’. In addition to being undemanding, weigelas are typically fully hardy. This specific cultivar can cope with temperatures down to -20C. Grow ‘Bristol Ruby’ in full sun to partial shade in order to stimulate flowering. Bees and butterflies are very keen on weigelas, as the abundant flowers make an excellent food source for all kinds of pollinators. New growth can be encouraged by cutting back a quarter of the shrub when the plant is dormant, i.e. in winter. Weigela ‘Bristol Ruby’ does not grow particularly large and will stop at around 2-2.5m if unpruned. Weigelas are really ideal for hedging and make excellent informal hedges, for example in a mixed shrub border. So if you are looking to plant some additional colour in your garden with minimal effort, weigela ‘Bristol Ruby’ is certainly worth considering.